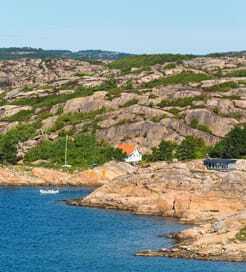 There are 2 ferry routes operating between Sweden and Denmark offering you combined total of 63 sailings per week. Stena Line operates 2 routes, Gothenburg to Frederikshavn runs 7 times per day & Varberg to Grenaa about 14 times weekly. As the frequency and duration of crossings on some routes varies we would advise that you do a live search for crossings from Sweden to Denmark to get the most up to date information. 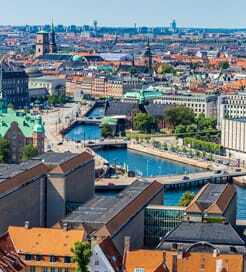 Denmark is a Scandinavian country in Europe, directly south of Norway, bordering northern Germany. Home to Renaissance castles, a riveting Viking history and highly-rated standards of living, Denmark offers a wealth of unforgettable experiences. It’s also widely regarded as one of the most liveable and happiest nations in the world thanks to its progressive politics, spellbinding landscapes and mix of contemporary and traditional architecture. Innovative Nordic cuisine has flourished in the capital of Copenhagen, with the restaurant ‘Noma’ voted the best in the world in 2014. Or you can take your pick from the 14 other Michelin-starred establishments scattered throughout the city. There are plenty of ferry routes to Denmark from the surrounding Scandinavian countries and within the country itself. With numerous ports spread across the Danish peninsulas and islands, travelling by ferry is a convenient way to reach this Nordic nation.